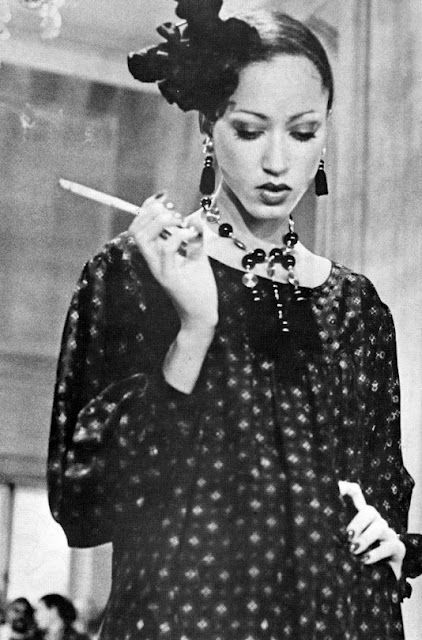 Pat Cleveland as Josephine Baker on a 1986 Patrick Kelly runway in Paris. 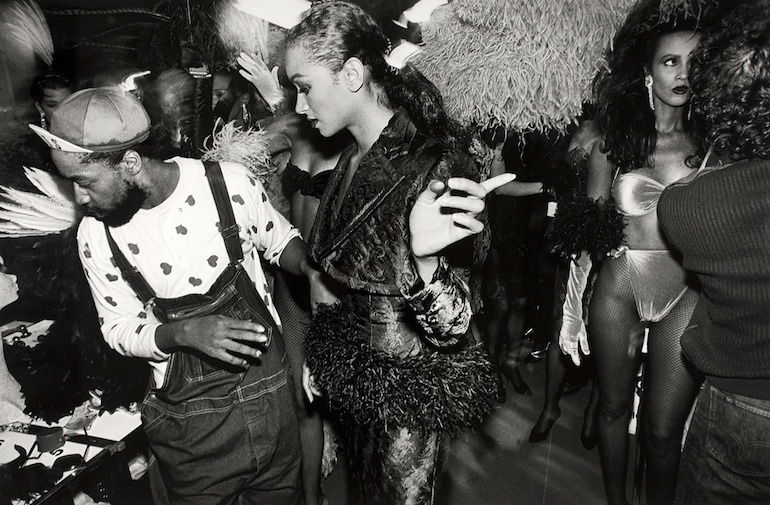 In Part One of our conversation for sessumsMagazine, Legendary model Pat Cleveland remembers her friend Patrick Kelly, the fashion designer from Vicksburg, Mississippi, who died of AIDS in 1990 in Paris where he lived and worked. 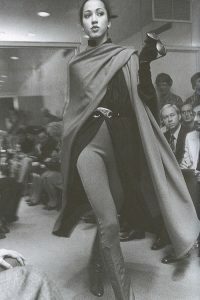 Kelly became a star after not only overcoming the brutal racism of his 1960s Mississippi boyhood, but also the more refined racism found in the fashion world of New York City once he arrived there in 1979. Cleveland was his mentor and advised him to go to Paris a year later – she gave him the money for the airfare – where she hoped the African American diaspora that had delivered so many men and women to their truest selves in France would deliver him to his as well. She was prescient for in 1987, with the sponsorship of Sonia Rykiel and Pierre Bergé, among others, Kelly became the first American member of the Chambre Syndicale du Prêt-à-Porter, the governing body of the French ready-to-wear. PAT CLEVELAND: I had this friend who was a hairdresser. You know, how you have buddies who are just beginning to make it when you’re just beginning to make it yourself? They come over to your kitchen and you play around doing hair and makeup? My hairdresser buddy called me one night and told me he was bringing a friend over. “He really loves you,” he said, “He makes clothes in his closet right now because his apartment is so small. He really wants to meet you. Can he come over? He is going to bring something over for you. We’re going to go do the Hair Show over at Columbus Circle at The Coliseum.” Remember The Coliseum? I was living on Central Park South at the time across from where the horses are parked there on 59th Street. Near the Plaza. PC: Oh, honey, no, it wasn’t fabulous. It was a tiny little apartment at the back of the building. I was really lonely. I think I was 27 or 28 at the time. I was lonely. I was angry. They came over – Patrick was the friend my friend brought over who wanted to meet me – and they said, “Oh, perk up! We’re going to go out and do this Hair Show, all three of us. You want to come with us and do a little singing number? Patrick here has a little Josephine costume for you if you want to put it on.” Because I had been going around singing back then at the Mudd Club and singing at Bond’s. I had been going around and singing Josephine Baker songs. You know, the La Petite Tonkinoise song. He said, “Oh, I know that song.” They had these big gold lamé curtains hanging down. You know how hair dressers are. Everything is lamé. Of course, they did my hair like Josephine once I got there. They put tons of grease on me. I felt all nice and shiny. I had on my real good show-biz makeup – which is if-it-doesn’t-shine-you-don’t-see-it makeup. I had on my highest heels from Charles Jourdan from Paris. His shoes were all the rage back then. I was behind the curtain. So I flipped open the curtain like that stripper from the 1920s. I can’t remember her name. They made a movie about her. PC: I don’t know. But I flipped open that curtain like that stripper I can’t remember. The spotlight hit me. I had on my fishnet flesh-colored stockings with little pearls hanging off them. I did a whole Josephine number with my bananas bouncing and stuff. I think there’s video of it somewhere. This was before Columbus Circle was gorgeous. It was like a dump. The had those car shows there at the Coliseum. It was really tacky. So he got in touch with Antonio and Antonio kind of helped him a little bit. I guess he met some other nice people because then he started going out to Club Sept. That was where you met everybody who’s “in the night.” All the night stars. All the couture cutters. It’s where you went to be seen and have fun. He started hanging out there and before you knew it he had this little atelier only a few doors down from the Café Flore. It was on the first floor and you could just walk in there. You had to walk down into it. So when I went back to Paris he had already gotten everything together. And every black girl who went to Paris ended up magnetized toward his studio because the fact is that was home away from home. He would fry chicken and cook grits and collard greens and cornbread. He would invite us all over to eat. It was so charming because he was always sort of modest. He was nourishing everybody. What he would do is that he would pray all the time. When you came into his studio, he would always talk about God. And pray. He was like a little preacher. He would make a circle of us and say, “Oh, while you’re here, let’s pray.” Everybody would hold hands and bow their heads. And he’d say, “Oh, thank you, God, for all these blessings you’ve bestowed upon us. We’re all so lucky to be here. Please bless us all. And give us guidance. Amen.” That would always be his prayer. And we’d all feel invigorated. And satisfied. And happy. Because he was like a healer in a way. He had all these dolls everywhere, too, and all these kind of cutie brown images around from the south. He was always dressing everybody with buttons and bows. He ended up being in Paris all the time. He never came back really. He never came back. He made the great escape. Just like Josephine Baker. Oh my God, he was so in love with Josephine Baker. That was sort of our lynchpin and what connected us. We had this great love for Josephine. My great aunt was Josephine’s Sunday School teacher and taught her piano and taught her how to sing. When it was time for Josephine to get out of St. Louis, it was my great aunt – who was 6’3” – who told her “go and be with the show.” Because Josephine was so poor. They were so poor back there in St. Louis. KS: It sort of broke my heart when you called Patrick a healer because at the end of his life he could’t heal himself from AIDS. PC: But those kinds of things are so unpredictable. Why are these wonderful people chosen? That’s how I look at it. Why are stars chosen? I think Patrick was a Chosen One. He and Antonio. They were so significant. They were so important. They were so important because they had to suffer a lot to be who they were during those times. Back then you couldn’t really be yourself. But they were bold. And they were truthful. And they were 100% very spiritual. They were also giving a lot to people. They cared about people. Patrick cared a lot about people. He was like a father to everybody – or a brother. So you would never think something like that would happen to someone like that. But those things are unpredictable and scary. Because people saw that as something really bad. Half the boys I knew back then are gone. And those boys were so beautiful. KS: Do you still carry around grief for that time and for those boys? Cleveland between shows during the 1980s. PC: You can’t think of it like that. All that torturous sadness. Instead you have to think of all the gloriousness and what they gave. All their beauty and happiness. Just being gay toward the world – as the word is supposed to mean. You wake up every morning and you put your music on and you dance and you love the people who are around you. You make a party so everybody can feel good. These were party people. KS. Did Patrick ever talk with you about his childhood in Vicksburg? PC: Did he talk about it? All you had to do was look at him to know what his childhood was about and what he went through. He had to get out of Mississippi. It wasn’t happening in New York for him. They were never going to give him a chance – a black boy from Mississippi – as good as he was and as much as God loved him. God did give him a chance in Paris though. I knew it and he knew it. Because he was praying all the time about it. He was praying, honey. He was praying. I think this book you’re considering writing, Kevin, can be a cry for humanity from Patrick through you to be happy and healthy and for people to not be treated badly. He was such a happy and healthy person, but something got ahold of him. It’s like when you get something in your eye and you can’t get it out. He got something in him and he couldn’t get it out. Make this is about having a platform to tell people about someone who lived and had such a positive attitude about who he could be – from day to day to day to day. Patrick Kelly created his own life. Remember that movie set in Louisiana Beasts of the Southern Wild? That was like a fairytale. Patrick had to face the beast of hatred in people’s hearts because of racism in his own fairytale. And then he had to face the beast again at the end of his life because of the fear people had around AIDS. His life was a fairytale. But it had its beasts. I think Patrick’s whole life was about trying to find a home. Look what happened. He had the similar thing as Josephine Baker. He was locked out of his home when he was boy when he was thought to be bad and had to sleep on the porch. Josephine was locked out of The Stork Club. She was locked out of opportunities because she was a woman of color. Patrick had the same thing on Seventh Avenue. He was locked out. KS: You’ve both had to face racism as African Americans in the fashion business and yet were both exalted in ways because of your race. Is there a fine line between racism and being objectified for one’s beauty based on one’s blackness? PC: Racism is about hatred. Hatred of something that is different – the other. But my attitude is that there are no races. Just the human race. I think I was pretty lucky basically because I have a lot of willpower. I am like that lotus where the leaves fall off and I just keep growing and growing. I don’t let things stick to me. KS: What did you think of Patrick’s utilization in his fashion of black racist tropes – or do you consider them racist? PC: We didn’t see those things as being bad long ago. No one looked at Aunt Jemima cookie jars as being bad. Everybody wanted to have an Aunt Jemima cookie jar. We wanted to be Aunt Jemima and Uncle Ben because it was a black face and it was the only thing with a black face on it. It wasn’t to throw something into anybody’s face. It was just to say, look, here’s some art that has a black face on it. Yves Saint Laurent loved Patrick. Yves had black statues around because it made him feel at home just as it made Patrick feel at home. We used to all call Yves “Blackfoot” because he was part black from living in Africa. That’s why Yves and Patrick had such a good time together because they reacted to their blackness. Patrick related to those images without shame. That is the key, I think. He didn’t feel any shame about them. KS: I had never heard that nickname for Saint Laurent. KS: Did he actually have black blood in him? KS: We all do finally. KS: Do you ever think about that time in your life full of parties and drugs in the 1970s and 1980s and ever regret any of it, Pat – the hedonism of it all – especially because of the specter of AIDS? PC: No. I never think of all those things in that way. All of that was just natural that people were having fun. It was like the Roaring Twenties. It was forbidden drugs and forbidden behavior. It’s always naughtiness. The naughtiness of being naughty. Everybody was naughty. But that was just another side of yourself. All sexuality is natural. Isn’t it? KS: I am a child of Mississippi myself – just like Patrick – and I look back on some of my own naughtiness in my own youth and still have a bit of Protestant guilt about it. But it’s all about light and darkness. You can’t have light without the darkness. PC: I don’t think it’s about darkness. Life is life. What? You’re not going to live it up? You have to live it up. Sometimes there are dangerous things and sometimes butterflies get caught in spiderwebs. But it’s not about light and darkness. It’s all life. All of it. Kevin Sessums is the author of two New York Times bestselling memoirs, Mississippi Sissy and I Left It on the Mountain. A whole YEAR of entertainment? Or one single night out for popcorn and a movie? Price is the same! © 2017 KevinSessums. All Rights Reserved.